Great post. iRobot's MIT brain trust of Colin Angle, Helen Greiner and Rodney Brooks have already talked about this possibility somewhat, that you would have a team of robots doing somewhat different tasks with a main, smarter robot supervising. They already are developing such "Swarm" technology for the military, so it may one day translate into the Roomba line. Bit methinks that's probably a little ways off for now, simply because of cost. We're at the point where you can do a whole lot with robots, but keeping the price down is key and very, very hard to do. Put your idea on the tv show THE INVENTOR! They give you $50,000 to pursue the idea. Of course you have to be chosen for it. Actually, if anyone has been successful at keeping the price points down it's iRobot. I don't know if you've seen anything about the latest from them (the Create) but it's asking price is going to be under $200. At least that's what I've read. If anyone is going to do it and keep it reasonable they are. 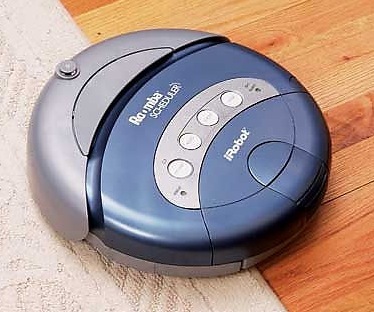 I own all three of their models (Roomba, Scooba and Dirt Dog) and their functionality and quality far exceed their cost. I can't sing their praises enough. I like the swarming idea but wonder where you'd keep all these devices? I mean, what's the point of making it smaller if now all of a sudden you've got six of these things? In the end you're going to end up taking up just as much space if not more. Maybe the smaller units could be housed within the parent unit somehow? It's an interesting idea. hello friend excellent post about Next Step For Roomba: Mesh Networked Mini Units thanks for sharing!! amazing post about Next Step For Roomba: Mesh Networked Mini Units thanks!! They already are developing such "Swarm" technology for the military, so it may one day translate into the Roomba line. Bit methinks that's probably a little ways off for now, simply because of cost. We're at the point where you can do a whole lot with robots, but keeping the price down is key and very, very hard to do. Good Idea I wanna buy it now. I mean, what's the point of making it smaller if now all of a sudden you've got six of these things? In the end you're going to end up taking up just as much space if not more. This instrument is really nice and effective.Keep on posting such nice informative material on you blog.I am impressed. Roomba line. Bit methinks that's probably a little ways off for now, simply because of cost. We're at the point where you can do a whole lot with robots, but keeping the price down is key and very, very hard to do. Wow, where did you pick up your Chinese? You speak Chinese so well!